I love pizza. And pepperoni bread, calzones, stromboli... pretty much anything that comes out of your neighborhood Italian spot is good to me. We have a favorite neighborhood pizza place (we opt for small spots with New York-style, foldable slices instead of big chains), but I bought a nice pizza stone (more than 50% off) at the Emile Henry sale back in December and I decided to make 2011 the year I master homemade pizza. Note: This is my second pizza stone. I bought one in 2002 that was porous and difficult to clean. I almost gave up on pizza stones until I found this one. I think it's worth the full retail price, but I got mine at a discount. It can go in the dishwasher (I'm very lazy) and it can even be used on a grill or stove top. If you don't have a pizza stone, just use a baking sheet and keep it moving. 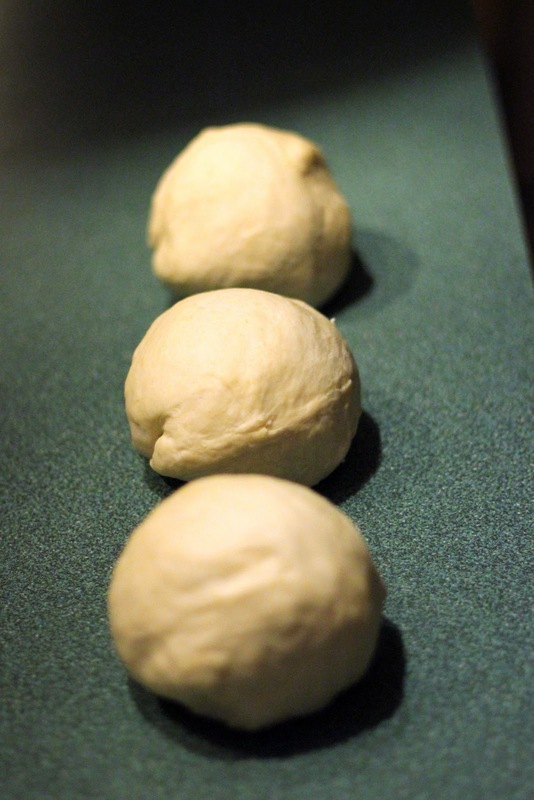 I've tried several recipes for pizza dough. I've even spent my hard-earned money on refrigerated or frozen dough (which is acceptable). Once I found this recipe, though, I realized I could make tons of dough without spending a lot of dough, so it's now our staple recipe. This recipe requires a Kitchen Aid Stand Mixer. My Kitchen Aid Artisan is on its last leg and it struggles with this dough. I'm adding a new mixer to my wishlist for next Christmas. If you don't have a stand mixer, I'd pass on this particular recipe. You can always start with store-bought dough and continue from there. This is one of the first Artisans from when they came out in 2002. I don't know why I chose this color. You basically just mix the dough up in the Kitchen Aid, shape it into balls and let it rest for a few hours or a few days. I take The Pioneer Woman's advice and just mix up a batch for the week. Not that you need to eat three pizzas a week, but you could. I divide this recipe into three equal parts because I like to make a thin crust. If you like a thicker crust (or you're working on a larger recipe) you can divide the batch into two. I place each ball of dough in a zip-top storage bag and let it sit in the fridge for up to five days. Or, you can let the dough rise for a few hours and use it the same day. Some reviewers of the original recipe say that the dough gets better over time. I'll let you know. I'm baking with a six day old batch today. Next week I'll share three different recipes that you can make with this dough. I've found it to be very versatile and you can use it for much more than just pizza. If you want to cook along with me, get a batch of this dough going this weekend and make the recipes I post next week! In a mixer, combine flour and salt. With the mixer running on low speed (with paddle attachment), drizzle in olive oil and honey until combined with flour. Next, pour in yeast/water mixture and mix until just combined, and the dough comes together in a sticky mass. Switch to the dough hook and knead on low speed for 8-10 minutes. The dough should cling to the hook in a sticky ball and not stick to the bottom of the bowl. If the dough is too wet, add small amounts of flour until the dough forms a ball. Coat a separate mixing bowl with a cooking spray, and form the dough into two or three balls. Toss to coat dough in spray, then cover the bowl tightly with plastic wrap and set it aside for 1 to 2 hours. Alternately, store balls of dough in the fridge (place each ball in a zip-top bag first) until you need it. Note: It’s best to make the dough at least 24 hours in advance, and 3 or 5 days is even better. You can make this dough healthier by switching out 1/2 of the flour for whole wheat flour. I prefer the original recipe in this case, but do what you think is best for you.